January is a month of big change for me! I’m officially on a leave from my day job to see if more relaxed days helps Mike and I get pregnant (more on that here). So I’m adjusting to a completely different schedule. We’re finally settling into our new house, starting to fill rooms and truly make it feel like a home. I’m doing way more home cooking. I’m giving (even more than usual) attention to my blog. And I’m setting some financial resolutions to help with personal goals thanks to my friends at ATB Financial! From January through April, I’ll be working with ATB Financial on sharing blog and social media posts focused on financial literacy and saving / investing—in particular, investing your money through an investment tool called ATB Prosper. I hope these posts educate and inspire you to make financial investments of your own—getting you closer to your dreams, whatever they may be. Because let’s face it, money does help with happiness and making decisions that grow your money quicker is one way to add more happy to your life. I hope it does for me! Note: my series of ATB Prosper blog and social media posts are part of a paid (sponsored) partnership. So what is ATB Prosper? To start using ATB Prosper, and get a recommendation on what kind of investment portfolio best suits your goals, you answer a few questions! ATB Prosper is meant to help you invest for things that are a minimum of approximately two years away like a vehicle, house, RESP, going back to school, or a big vacation. It’s designed to be intuitive enough so you don’t need to rely on a financial advisor, taking into account your level of risk, timelines and current financial situation to help get you set up on a customized investment plan. Once set up, you can just hop online to make contributions and check progress towards your goals! ATB Prosper doesn’t work if you don’t have goals in mind. What are you working towards? Why do you want to invest and grow your money? This month I’ve been thinking a lot about finances, including setting some financial resolutions (which is especially important now as I’m on my leave). Eating at home more days of the week. Knowing groceries for a whole week are cheaper than dining out each night, having more meals at home is a simple (and delicious) way to save money. I’m also hoping to buy less clothes and make better use of what I already own. Like almost everyone else in North America, I tried to Marie Kondo my clothes and was ashamed at how much I owned and how little variety I wore. Finally, I want to pay for things with debit more than credit—although the flight points are nice, I’d like to be more realistic about how much money we actually have to spend. All of those smaller financial changes will hopefully leave more money for us to invest and achieve bigger goals. Saving up for IVF in-vitro fertilization. Assuming our path to pregnancy continues as it has been for the last four years, we will likely need to go down this route to see if we can conceive. A single round of IVF costs at least $10,000 (for just a chance. Most couples try multiple times). So we’d like to save and invest for that. We also want to do a big trip to Asia. I’m Vietnamese but have never been to Vietnam. We’d love to do a Vietnam, Thailand and Korea trip sometime in the next two years. And, there are some home upgrades we’d love to make over the next few years too. I’m starting off small with a few furniture pieces for some new rooms we’re creating (a library and an office), and we’ve got some other things in mind but home upgrades don’t come cheap. Do my goals spark some of your own? And once you have these goals set, how can you ensure you’ll achieve them? How Can You Keep Your Financial Resolutions? It’s those goals I have in mind as I set up an ATB Prosper account. That’s one way I’m going to try to ensure our financial goals are met and resolutions kept this year. Create small, realistic financial resolutions—things that have a tangible action you can actually do each week. Every time I select an old piece of clothing from my closet to wear, every time I have a home cooked meal, every time I swipe or tap my debit card instead of my credit card, those all are small and realistic-enough actions I can take to help ensure I’m staying on track with my financial resolutions. Get help with your bigger savings goals—that’s what I’m doing with ATB Prosper. I don’t know anything about investing but a bank like ATB Financial does. Taking advantage of programs and services out there that are fully designed to help you better understand the process and grow your money to reach your dreams, is just a smart thing to do. Even better (in my opinion anyway) when it can be done online. Take an approach that works for you—I know some people who Excel spreadsheet their every purchase. That’s too much for Mike and I. It would be too much to try and manage. It would drive us crazy, probably. I mean, if it works for you, that’s great, but that kind of thing doesn’t work for us, so try to develop a savings or financial tracking system and approach that is a fit for your specific personality, how you live your life, and one you’ll realistically be able to stick to. Don’t get discouraged if you’re not seeing results right away—we can be a pretty instant gratification society these days, and it’s easy to want to give up or get discouraged if you’re not noticing big ticks in your savings or investments. But don’t give up. Don’t get discouraged. Set a realistic timeline (like, the entire year!) Maybe set a 6-month goal that you’d like to either get your debt down to, or get your savings up to. Maybe, depending on how you’re tracking your finances, you can track monthly to see if February you spent less than January. Whatever way you do it, don’t be upset and don’t give up if the change is small or maybe there’s no change one month, or maybe you’ve gone backwards another month. That’s okay. Stick with it. Remind yourself of your goals and those actions you said you’d take to achieve them, and keep at it. Over the next few months, I’ll share more about how I’m working towards achieving my financial goals, how ATB Prosper is helping with that, and also give you readers tips and a chance to win some awesome prizes that will help you on your way of achieving your dreams too. 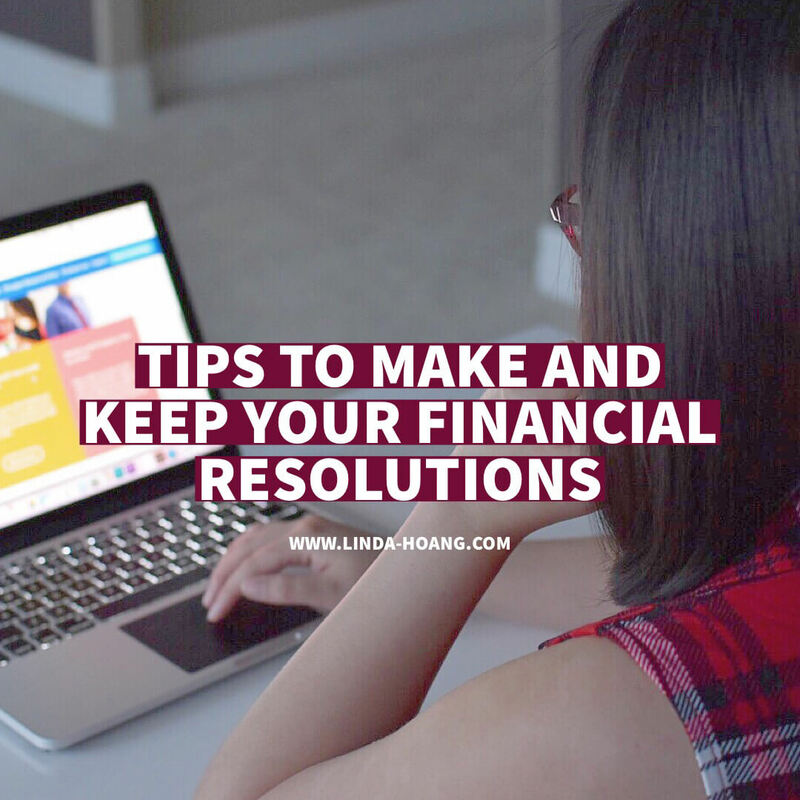 Pin + share my blog post: tips to make and keep your financial resolutions! My January so far has been very fulfilling and inspiring. I’m really excited about what the year will bring, and I’m excited about making smarter financial choices to get Mike and I closer to our dreams. Thanks to ATB for sponsoring this post, and stay tuned for next month’s financial inspo and giveaways! Disclaimer: I am working with ATB Financial in a paid partnership to help highlight their ATB Prosper investment tool. This has no impact on opinions stated in this post. These are my actual financial goals and my actual advice for how I’m going to help achieve these goals and hopefully help you achieve yours! I’m excited to see how ATB Prosper can support me in these goals as well. Saving money is one of my favourite topics! We like to keep track of things and it really helps to see where your money is going. We don’t really have a budget but use a budget binder to keep track of everyday expenses. Something we found helpful is to work with an allowance. Once all the bills and savings are covered, we take out a couple of hundreds on pay day for miscellaneous expenses, like eating out, snacks, etc etc.. I look forward to reading your tips! !